Today you will see some great projects using our beautiful January Ribbon Club Assortment from our very talented design team. They always come up with some super ideas. Isn't this assortment great?? It contains 9 styles and a total of 18 yards of gorgeous ribbon. If you aren't already a ribbon club member, why not join us today! You will get a fun new ribbon assortment shipped automatically each month. At the end of the hop, comment on this post answering the question below for a chance to win our January Ribbon Club assortment shown below. What is your ideal Valentine's Day Celebration? Doesn't have to be with your honey - could be with a good friend or even just solo! Our winner will be selected from the numbered comments on this post on Tuesday , 1/19. Be sure to check back on Tuesday evening to see if you are our lucky winner. love love all the projects! As far as Valentine's Day. I think as long as I spend some time with my honey I am good. I agree with you about having dinner at home with my dear hub. It's especially nice if he cooks it! Now, off to hop! I visit all Dt blogs! And they made so amazing creations! A "surprise" date -- have DH tell me to dress up and take me somewhere wonderful! I was able to visit all but Karens. I went back 5 times to see if I missed the post. not sure :( Anyways I really enjoyed all the beautiful projects from the DT! Thank you all for such a wonderful hop!!! Such sweet projects! I'd celebrate any day at the beach with chocolates or a chocolate ice cream! Thank you for the hop. Everyone had such beautiful creations. For Valentines, I enjoy special times with family and of course, the top will be my husband, Larry. During the day, Larry and I give Valentine boxes to our grand children and in the evening, it is just the usual time together which we enjoy. Around here, not too many places to eat out and the weather is super cold outside or nasty around Valentines. Beautiful collection of ribbons! Love pink, white and red! A nice dinner out is my favorite way to spend Valentine's Day! Great hop! I enjoyed all the beautiful creations! Lots of Valentine inspiration! Love all the projects that the design created, just lovelY! So many wonderful ideas from these talented ladies. My idea of a great Valentine's Day would be to have hubby cook (and clean up) and watch a romantic movie together. Forgot to answer the question...duh me! Since I am by myself, I usually buy some nice chocolates and stay home...not very exciting huh? The DT did a fabulous job! Loved all the inspiration! My ideal Valentine's celebration is going out to eat at a nice restaurant with hubby. Also having chocolate covered strawberries! 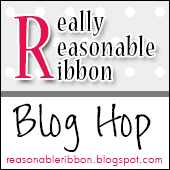 Very pretty ribbons and I enjoyed the blog hop. Dinner at home with my hubby is ideal for me. Beautiful creations by all the designers, thank you everyone for sharing. I'll have to say a Valentine party with the kids at school, or spending time with my grand kids are an excellent way to spend the day. Thank you for a very inspirational blog hop. I've pinned many of the projects on my Pinterest board to be sure to find them again when I lack inspiration. My ideal Valentine's Day celebration would be a tasty dinner at home with my hubby. Peace and quiet style. Perhaps watching a movie afterwards having dessert half-way through the movie. These are beautiful! My ideal Valentines is doing something active, like hiking and packing in a lunch. I am not a fan of waiting in lines to eat!